Welcome to this month’s Coffee & Questions segment here on The Purpose Show! The Coffee & Questions segment is a time when I sit down with 2-4 questions from you. You guys ask questions in many different places – email, Instagram Messages, Instagram Comments, Facebook, all of that. I have my team help me pull a few select questions and I answer them once a month. This is a time where I always physically have a cup of coffee with me because it feels super fun. It feels like I am sitting down with my friends, having coffee, and just…chatting. That’s what I want my show to feel like, especially this segment. If you asked a question, this is a time where I may answer it. So, sit down, cozy up, get a cup of coffee, and let’s chat! Ways you can overcome social anxiety and get out of your comfort zone. How she food preps for her family. Her book collection and how she decides what to keep or get rid of, as well as what she prefers in digital versus hard copy. Tips for shopping and maintaining a minimal lifestyle (especially at Target!). Hi beautiful friend! 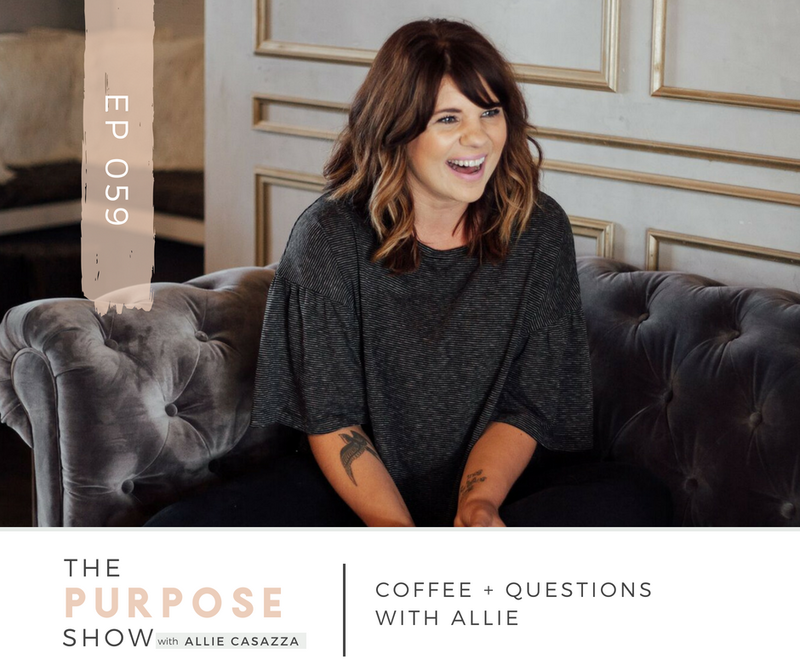 Welcome to this month’s Coffee & Questions segment here on The Purpose Show! The Coffee & Questions segment is a time when I sit down with 2-4 questions from you. You guys ask questions in many different places – email, Instagram Messages, Instagram Comments, Facebook, all of that. I have my team help me pull a few select questions and I answer them once a month. This is a time where I always physically have a cup of coffee with me because it feels super fun. It feels like I am sitting down with my friends, having coffee, and just…chatting. That’s what I want my show to feel like, especially this segment. If you asked a question, this is a time where I may answer it. So, sit down, cozy up, get a cup of coffee, and let’s chat! Question #1: Allie, I would love for you to address social anxiety and getting out of your comfort zone to visit with other moms. I come from a background of moms who have lots of kids, 4+, and so far I only have one, so I feel like I don't have as much in common or as much to offer to the conversations with the other moms in my area. It's something that I'm working on, just getting myself to open up, but talking is one thing that does not come naturally to me. #introvertmama. Any recommendations? Okay. Super love this question, mainly because I totally get it and oh my gosh, I wish that I had some way that I could show you all how I used to be. It's not really that there was anything wrong with it or with me, it's just that I was so different and friendships were more difficult for me. Social gatherings were really hard for me. I'm very much an introvert. I've talked about that a lot before. I'm so introvert, but a lot of the time when I share that about myself, people are really surprised. I think it's just because I've come on such a journey with myself in that regard and not let being an introvert hold me back from having connections, relationships and being social. Also, what I do for a living is pretty anti-introvert. It's a lot of extravert-ing. A lot of sharing myself, being vulnerable and talking. And whenever I come across a podcast listener or a blog reader or somebody in my audience in person, I never want to seem weird or standoffish, you know? I'm just introverting, but I don't want to seem like I don't care or I don't know, I don't want to give off the wrong vibe. So, it's been really important to me to learn how to be an introvert and take care of myself, but also step outside of my comfort zone, be friendly and have those connections. When we moved away, we moved out of state a few years ago and we didn't know anybody. That was really hard for me because it forced me totally out of my comfort zone in so many ways, especially socially. I had to speak up and talk and share. Even though I used to be more of a listener. So, what I would say to you, whoever asked this question and anyone else who was so glad that she asked it because this is you too, is get out there. I know it's probably not what you want to hear and it's not rocket science or anything new, but get out there and go. Then once you get there, join a mom’s group, join anything, something. Once you join, when you're there you don't have to come up with the conversations, but join in. So, what I mean by that is when we moved to Arkansas and I had joined the new mom’s group at a church that we thought we were going to end up joining. We weren't really sure. We had gone one week. They had a mom’s group. It seemed great. I just wanted to throw myself in and find connections because I was really struggling with loneliness and getting a little depressive. It just was not a good time. I didn't have anybody. I went to the mom's group. I forced myself to go. I got the kids all dressed. I showed up and being super awkward and introverted, but I'm there. I'm doing it. And when the conversation started I just jumped in as soon as I could. So, when I got there I was really friendly. I think there's something about pulling it out of yourself and stepping outside of yourself. I was just really friendly. I said “Hi.” I introduced myself, my kids and really stepped outside of my normal personality. So, it wasn't like I was quiet and awkward and then I sit down and somebody says something and starts a conversation, and I'm like, “Yeah, me too!” and all of a sudden I'm talking because that's even more awkward. I really pulled it out of myself and I thought a lot about the fact that I wanted to make connections, that I wanted people to know my heart. My heart is very people based; it's just that I'm not much of a talker (which it’s just hilarious as I speak into my podcast microphone.) But in social situations like that, I used to really not be much of a talker, but I pulled it out of myself. And then when the kids were with the childcare sitter and we were sitting at the mom's group together, just us moms, and somebody would share something that I had something that I could say, I would openly share. I would rush right past that nervous feeling of, “Oh my gosh, I'm about to talk. What if I talk over somebody? What if it's awkward?” And I would just jump in and say “Yes, me too! I totally understand that. Last week this happened to me and I handled it this way” or whatever it is, but I put in my two cents. I had a rule with myself where every other thing that somebody brought up I would share about. So, it's not like I was taking over the conversation and putting in my two cents on every single thing that anybody said. But every other, every two things that were brought up as a topic of conversation. I wouldn't sit them all out and I wouldn't join in them all. Does that make sense? If you've ever been in a formal mom's group or Bible study setting, you know exactly what I'm talking about. Usually whoever's leading has some discussion points that they're going through or Bible study guided questions that they're asking, and I wouldn't let myself sit out every single question. I wouldn't let myself go more than one without chiming in. That helped me to have a rule of thumb. But I also think it's important to remember that introvert is not synonymous with shy. Introverts just get their energy, they get restored by being on their own. Extroverts get their energy by being around other people. Studies show that both extroverts and introverts benefit highly from having a lot of friends, from being social, from having a week full of social things. It's really good for us to be around other people. We are created to be social beings. So, let's not confuse introvert and shyness. I hope that helps whoever asked that question. Question #2: I would love more info on how and what you do for food prep. We keep it pretty simple, but I feel like I'm probably missing out on the easy foods to prep and then reheat. Okay. So, first of all, I have a free pdf that I've created. It's all about simplifying your grocery shopping, planning your meals and prepping your meals. It's something that people really, really like. It's one of my most popular downloads. I will link that for you in the show notes, which you can find at alliecasazza.com/shownotes/59. It's totally free and it's really helpful. I broke this down within that pdf. So, I'm like you, whoever asked this question. It is mostly pretty simple. It's mostly meats, produce and cheese, but also a couple of “side” things. One of my favorite things to have prepped is grilled-up potatoes, like those baby red potatoes. I really like those and they're good for you. And it's a good filler, especially because we eat really clean. Sometimes only vegetables, or only vegetables and a little bit of meat is not quite filling for me. Sometimes it is. So, I love to have baby red potatoes. I slice them up and quarter them and then just saute those up with some olive oil or maybe some grass-fed butter and some herbs. Then, I put them in Tupperware and I store them away and they can just be reheated. You could do the microwave if you want to, but I try not to use my microwave. I usually heat them up in a pan. Sometimes I won't, I'll be honest, because I don't want the extra dish, but it does still save me time because potatoes take a long time to cook. And I'm not re-cooking them; I'm just heating them up real quick on a pan, if that makes sense. So, I like to have things like that. Definitely sliced cheeses is great. I don't really do this anymore but I used to make my own yogurt and I would have that made and stored in the fridge. Definitely chicken. I like to buy a flank steak at the natural market by my house and have Brian grill that up and season it really lightly and then slice it up. Steak is one of the few things that I'll actually eat cold. I think it's really good cold. Other than that I'm really weird about my food being hot and fresh. So, just like basic meats, potatoes. If you guys follow me on Instagram, you've probably seen how I always am sharing when I get home from grocery shopping, I don't just put the groceries in the fridge, I will wash and slice the berries, prep everything to where it's ready to grab and go. It's less about being super creative and having all these foods that you're preparing, and more about you're going to have to do these two or three steps to eat the food, why not just do it right after you buy it from the grocery store versus getting it from the grocery store, putting it away and then having to prep the food before you eat it? I get into that “batching mode” of, “I'm prepping my food, I bought it and I'm prepping it to eat” and now throughout the week I can just grab it and go. The berries are already washed and sliced. It's easy for the kids to grab. Things like that. I've shared this before too, but I also am kind of weird with my food feeling like it's all “reheats.” I definitely like to cook dinner and eat it right away, but there are some foods that I'm not weird about that I'll totally eat reheated. It’s just a preference of mine. You guys might want to get into the food prep zone and do way more than I'm doing. I'm just finicky about it. I'm a little high maintenance with my food. So, that's what I usually prep. Chicken, flank steak, potatoes, fruits and vegetables. And then I'll have some cheeses and stuff for the kids. Kind of a grab and go status. So that's what we do. It's really simple. I wish it was fancier and more like, “Wow, Allie’s amazing and super smart,” but that's what I do. I really poured my heart into this little course. 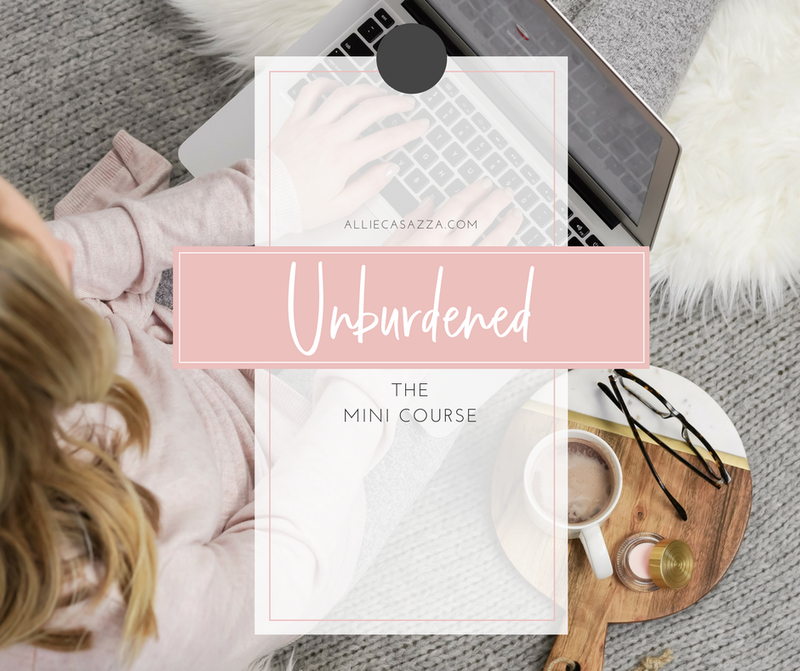 I created it for the mom who is really wanting to simplify, declutter, and pursue a life of less, but she is so burdened and overwhelmed with the mess of life. It’s not just her house. She wants to simplify at the surface of all the different things in her life so she can focus on her family more. So then she can focus more specifically on really, truly purging her entire house. Question #3: How do you decide which books to keep? Do you store them somewhere? Do you use digital books or do you have paper books? For you and your kids? Okay, so my thing with books is that I love them. I'm a major bookworm. Some books just need to be read on paper. Very, very few books, actually, I can look it up right now. Very few of my books are on audible. Okay. I've got 12 books in my audible APP right now and I've had my audible account for quite some time. I read about two to three books a month. So, that just shows you the ratio of how many books I have on paper. There are a lot of books in my house. So, the thing is I really love the look of a nice full bookshelf in a room, especially with my decor. I really like clean straight lines, very modern, very white decor and it can kind of look un-cozy sometimes. So, I have little tricks that I do to make my house look really lived in. You can sit on the couch and curl up your feet, but it's still beautiful and modern and my style. Extra throw pillows and throw blankets thrown on the side of the couch and layered rugs and things like that. And a bookshelf full of books in multiple rooms of my house. There's a shelf full of books in my room, a shelf full of books in the homeschool room, shelf full of books in the hallway coming into my living room. I love the look of lots of books. In my office I've got a bunch of books. I keep most of the books that I read unless I loan them out and don't get them back, which happens a lot. And that's one reason that I do like getting paper books because I like when my friends use me like a library but don't give me my books back. It makes me happy that they're reading more, that I'm encouraging them to read, and I can give them suggestions on what to read. But I do get rid of books that are either damaged or that I really didn't like. I've shared this before that I kind of bop between topics of reading and I'll read on one topic a whole bunch and then I'll go to something else. So recently, I was in a faith category of books and I was reading all these different faith-based books, The Case for Christ and Jesus Feminist and all these different faith-based books. I ordered one that looked really good, and it was about women in the Bible and God's view of women and being a strong woman in modern day, yet still being a Christian. And I was really excited to read it. I got it and it was written by a man. I just was put off by that and like, “Well this isn't what I wanted.” I skipped, flipped through it but I didn't want to read it. I didn’t want to waste my time on it. I ended up just donating it right away. I go to the donation center pretty often at our house, less often than I did when I was purging, but still pretty often. And books go in there when I know I'm not going to want it around. So, that's how I do it with the kid’s books, they rip more because they're little. But if it's not damaged and something that we're going to read again, I just love having shelves of books in my house. So, I think it's up to you. For me, it's worth it. It's part of my decor. It is something that I like. It's a quirk about me that I love having books everywhere. Of course they're organized and they're clean and minimal in the way they look. There's not one shelf full of all my books. It's scattered throughout my house to cozy up different rooms. But that's me and that's a really specific quality of mind. It's not like I'm telling everyone to do that or you'll even want to do that, but that is what I do. Question #4 (and our last question of the day): I see on your Instagram that you guys are at Target a lot. Me Too. How do you handle practicing minimalism and not going crazy at some place like Target? Any tips or strategies for enjoying shopping while also avoiding just accumulating more junk? This is an incredible question. I think it needs to be a full episode, (so, thank you, whoever asked this) but I'm going to answer it here too quickly. So, we live literally around the corner from Target. I could walk there in a few minutes. When I drive it takes me less than two minutes to get to Target. So, because of that I don't really make lists for stuff that we're running out of. We will run to Target multiple times a week and just grab what we need. I think being a minimalist for over six years now I have the practice and discipline to not go crazy at a place like Target. I've learned to see something and appreciate that it's adorable and not have to have it unless there's a place that I want to put it, or it will help me in some way, or I need it or love it in some way and I know where I'm going to put it. I don't really struggle as much with that, “Oh my gosh, this is so cute, I'm going to buy it” thing. And I think that just comes from a few years under my belt of practicing living a lifestyle of “intentional lessness” for lack of a better term. I really enjoy packing the kids up and just driving over to Target. Our Target has a Starbucks inside of it and I’ll get an ice coffee or a tea. The kids will bring a little toy with them and they'll walk by the cart and play little games with their toys together while me and Brian take a breath and get out of the house for a second. You guys have to realize that I run the business from home. We homeschool the kids. We are home a lot, so it's kinda like just going through our normal life and then we'll realize “Uh-oh, I'm out of Q-tips. Oh, okay. Everyone get dressed, we're going to Target.” And the kids are like, “Yeah!” and we'll pack everybody up. We really want to get out of the house because we're always here, so we use the Target around the corner for that for us and it's really great. But you'll notice we leave with the Q-tips and that's pretty much it. The kids don't expect toys when we go there. We've never done that with them so they don't irritate us by wanting to go and get a toy or anything. It's just really easy. So that's how we do it. But I think it really just comes from practice. Don't go to that cheap dollar area. It's just like total clutter zone. I'll stay away from the clothing section a lot of the time unless I'm looking for something because, first of all, it's usually cheap and not super high quality and won't last long. And also, because I do have a little bit of a harder time in that section. I just really love clothes and fashion and styling myself. But if I have everything that I need in my closet and I'm not looking for anything, I won't go over there. The other day I went over there for the first time in a while because I had needed to get a new pair of workout pants and I didn't want to get them at Lululemon. I wanted to get a cheap pair of running pants that I could destroy. I went over there and it was nice. I browsed. I looked at the T-shirts. They had so many cute things. I looked at the shorts. I grabbed my running pants and I just left. I was able to appreciate how cute everything was, but know that I didn't really need anything and just leave happily. So, I think it's just about the practice of minimalism.